Whether you’re going full out or just want to do a little something on Halloween, these are our top 3 picks that will get you in the Halloween spirit. Obsessive Compulsive Cosmetics limited edition “Everyday is Halloween” collection consists of four makeup sets that includes a Lip Tar™, a Nail Lacquer, and two pots of a color (including Loose Colour Concentrate and Cosmetic Glitter), that can be used on their own or together for a variety of looks. The MadCap Madame Set, Sephora.com, $47.50. Looking for a temporary hair color without the commitment, look no further. 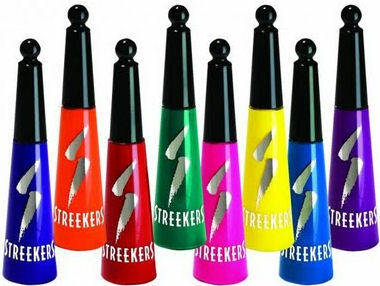 Streekers is available in 8 eye-catching shades and lasts until your next shampoo. Streekers.com, $11.95. The new “Exotics Lip Gloss Collection” from Whitening Lightning includes 5 innovative colors that can be worn alone or combined for a perfect Halloween pout. These moisturizing lip glosses contain collagen peptides to increase lip volume and reduce lip wrinkles, and the built-in light and mirror lets you do touch-ups, which is great for all that time you’ll be spending in a haunted house. WhiteningLightning.com, $38.